Demonstrating the value of cross-campus collaboration, an interdisciplinary team of Georgetown students has won first place in a regional public health competition – edging out six other universities’ teams for the top slot. The five-member Georgetown team presented its winning public health proposal, taking aim at reducing hate crimes against lesbian, gay, bisexual and transgender (LGBT) youth in the District, at the First Annual D.C. 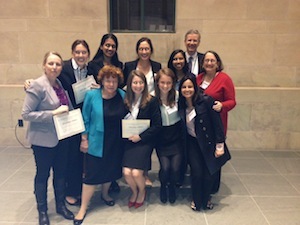 Regional Public Health Case Challenge on Nov. 15. Co-hosted by Georgetown University (new window) and the Institute of Medicine (new window) (IOM), a part of the National Academies of Sciences, the day-long event capped two weeks of intensive preparation by each student group. The Georgetown team exhibited true teamwork, drawing on the best from their varied academic backgrounds, according to Ranit Mishori, MD, MHS, (new window) an associate professor in the department of family medicine at Georgetown School of Medicine (new window) who helped organize this event along with Anne Rosenwald, PhD (new window), associate professor in the department of biology. “They did not know each other before we put the team together, but it was an incredible teamwork experience for them. They gelled quickly, and fed off each other’s ideas extremely well from the beginning,” says Mishori. Students hailed from medicine, business, public policy and health care management majors and programs. Team members included: Chandani Desai (C’15), Claire Lang (C’14), Megan Prior (M’15), Suzanne Huszagh (NHS’14) and Darshana Prakasam (B’14). Prior, a third-year medical student, says she valued the opportunity – rare in medical school – to work with students from all academic backgrounds. The case in question required that the teams put on their consultant hats, challenging them to submit mock grant proposals addressing the problem of violence against LGBT youth in the District. The proposed interventions needed to be “interdisciplinary, innovative, equitable, justifiable, and financially sound,” according to the hefty 25-page case released to each team Nov. 1. The Georgetown team, which was coached by Irene Jillson, PhD (new window), and Michael Stoto, PhD (new window), both from the School of Nursing & Health Studies (new window) (NHS), developed a curriculum and social media campaign “to empower bystanders to speak out against violence committed towards LGBT youth,” according to the students’ presentation. In their proposal, the students laid out statistics on the problem in D.C., identified existing infrastructure, established a project timeline, tactics and budget, and proposed detailed measures to evaluate the initiative’s success. For NHS health care management and policy senior Huszagh, preparing for the competition underscored the complexity of working in public health policy. The case that was sent to all teams was penned by another Georgetown group convened by Mishori and Rosenwald. These included: Sweta Batni, a fourth-year PhD candidate in the global infectious diseases program; Alisse Hannaford (C’13), a research assistant in the department of family medicine and recent Georgetown graduate; Blake Johnson (C’14), a senior majoring in the biology of global health; and Michelle White (M’16), a second-year medical student. “Writing the case allowed me to tackle and develop a problem on a topic (violence) and a population (LGBT youth) that was unfamiliar to me. I got the opportunity to expand my knowledge and training in public health and to apply this knowledge to a real-life, complex problem faced in D.C.,” Batni says. The interdisciplinary mindset fostered by this process is precisely what students need as they embark on their professions, Mishori says. “In real life, these types of tough issues are solved by interdisciplinary, interprofessional teams. Yet we do not typically give students a lot of opportunities to work with different fields and disciplines,” she says. The Georgetown team’s proposal faced stiff competition, ultimately beating out those presented by George Washington University, Howard University, American University, George Mason University, the Uniformed Services University of the Health Sciences and the United States Naval Academy. According to Jillson, one of the coaches, the Georgetown win symbolizes the University’s leadership in several key areas. “Our Georgetown team was extraordinary, and yet another example of Georgetown’s contributions to public health, LGBT rights, and the health and well being in the D.C. community – as well as cross-campus, interdisciplinary collaboration,” Jillson says. 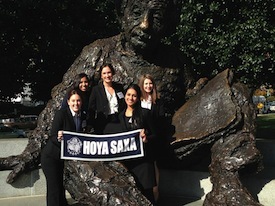 As the winning team, Georgetown is eligible for free registration to the March 2014 Emory Global Health Case Competition. The idea to launch the D.C. Public Health Case Challenge was born at the 2013 Emory event, where Rosenwald and two IOM staff members first discussed the idea of collaborating on a Georgetown/ IOM event in D.C.
“Once I met Bridget Kelly and Leigh Carroll from the IOM, the three of us got together with [Mishori] and began planning over the summer. It was truly a group effort from start to finish to pull off the D.C. event,” Rosenwald says.